The Orion Orchestra has built a reputation as one of the most dynamic orchestras on the UK’s music scene. 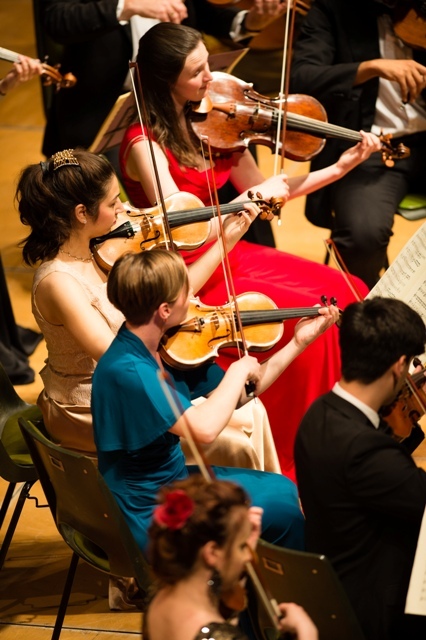 Founded in 2005 by conductor Toby Purser, the orchestra exists to promote the best young musicians in the country, with its performances recognised for their vitality, energy and imaginative programming. They recently returned from Singapore as guests of the Shaw Foundation and Yong Siew Toh Conservatoire, coinciding with the orchestra’s 10th anniversary. Since the orchestra’s formation ten years ago for ‘A Night Under the Stars’, notable soloists have included Joanna MacGregor, Miloš, Julian Lloyd Webber, Tasmin Little, Susan Gritton, Anne Murray, Nicola Benedetti, Valeriy Sokolov, Jack Liebeck, Charlie Siem, Tom Poster and Guy Johnston. They have also been conducted by Edward Gardner in two concerts at the Royal Festival Hall. One of their key initiatives is the special concert series for children, ‘Noisy Notes’, presented and conducted by Sue Perkins, and aimed at inspiring the next generation of young musicians. They have recorded an acclaimed CD of Rachmaninov’s Piano Concerto No.3 with the young virtuoso Panos Karan, while a live recording of British music was released by Cameo Classics in 2012. Aside from classical repertoire, they have recently toured and recorded Rick Wakeman’s Journey to the Centre of the Earth, King Arthur at the O2, a CD of Symphonic Pink Floyd, and a further DVD released last year of music by John Lord, recorded live at the Royal Albert Hall.